On our property, we had slash we couldn't reach safely with our tractor or pickup to haul away to our slash site. Matt and Carl were totally professional destroying our slash. They arrived when they said they would, they went right to work and never quit. We had contracted for 8 hours and they worked a full 8. Our house perimeter was completed in half the time we thought it would take. So they started on some of the steeper parts of our property. Wow!!! We feel safer now that our slash has been chipped. We should be seeing grasses pop up between the trees next summer. They met our budget for mitigation for this year. We'll hire them next year and the next!!! Had an appointment for fire mitigation and general health of our trees. They did a fine job of evaluating our property and actually recommended not doing a bunch of work we expected. Money saved and feel good about our property. Aaron and Chad did a wonderful job on our trees. They cleaned up the yard when finished. They were respectful and trustworthy. Definitely recommend Splintered Forest. I was extremely impressed! Splintered Forest is a professional group that works safely and efficiently. one tree was scheduled for removal, but after it came down it was apparent another needed to also be removed. They quoted the second tree removal on the spot and dropped it while they were here. Aaron and his helper did a great job... Splintered Forest is highly recommended! Splintered Forest was fantastic! I was struggling with my insurance company trying to get a Defensible Space plan setup with them, and they were not giving me enough specific details, thus I kept failing their inspections. Brad with Splintered Forest came onsite, and marked all of the trees that needed cut down for the plan. He also worked with me to save some "character" trees that we wanted to save, thus removing others around those instead. A+ service from him! Because my insurance company had given me a short timeline to complete the mitigation, I had to get the trees cut fast. That unfortunately led me to hire a different contractor to assist with the cutting, which I have deeply regretted. Next time, I will look no further than Splintered Forest for the whole project, as that would have saved me quite a bit of stress. The bad experience I had with the other contractor reminded me how incredible Splintered was through the whole process. After the tree's were take care of, Kara came out to inspect. She spotted some little trimmings that we missed, and allowed me to send pictures of the specific trees that required additional attention, after I finished the additional trimming. She then had a completed report to my insurance agent within just a couple days! Again, A+ service from her! This company was truly a Godsend after the stresses I went through with Insurance and other contractors. Keep up the great work, and thank you again!!! Crew showed up on time, and did an awesome job. Trees were brought down, and area completely cleaned up to point you would have never known they were there. Highly recommend this company, would use them again without hesitation! Splintered Forest has been a customer of ours for a few years now, they are such a pleasure to work with, the guys are awesome, everyone is friendly and they do incredible work! Splintered Forest provided exceptional services. The crew was professional, knowledgeable, efficient, personable and very helpful in responding to our questions. We were incredibly impressed with the expertise and speed with which they got the job done. They were also very conscientious with the clean up. The crew was sensitive to my chemical sensitivities and allergies and made accommodations for me without hesitation. We are very appreciateive for their outstanding services and customer care and we strongly recommend them to others. Don't hesitate to call Splintered Forest for your fire mitigation and tree trimming needs. They were prompt and professional, did the work required and cleaned up the slash afterwards. Awesome job all around. I want to THANK everyone at Splintered Forest for the work they did on removing my silver maple tree. The crew Charles, Josh and Aaron we're very professional and proficient. They did a great job, even with the cleanup. Thank you Brad for working with me on the quote even though it had expired. And a BIG, BIG THANKS to Kara. She was so patient with all my questions and concerns. I would highly recommend Splintered Forest for all your trees needs. So impressed. Alex and Caleb were on time, polite, neat and most importantly safe! Took down 2 huge trees that were very near the house with their "Super Crane" without any issues as well as 10 other trees. Would certainly recommend and I am sure will be using Splintered Forest again! I highly recommend Splintered Forest Tree Services. They are a professional organization from start to finish. The estimating process was fast and efficient and the email reminders of the scheduled date, time and arborist were most appreciated. The best part of their service was the safe and efficient method they followed to cut 5 trees close to our house using their Palfinger Knuckleboom crane system. Their hydraulically controlled boom truck allowed the operator to grasp each section of the tree, cut the section, then lower it to the ground. The entire tree removal process was controlled by the operator and the crane and no part of the trees ever fell to the ground. 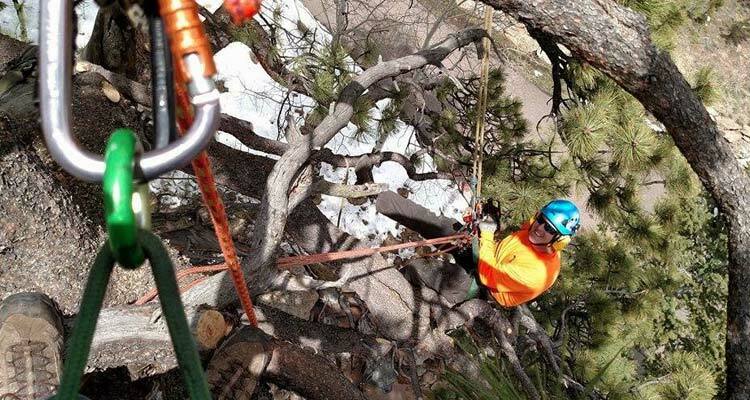 This was an amazing safe process to protect our property and to protect the arborists. Splintered Forest Tree Service was the only company offering the crane system for tree removal and certainly the best choice I could have made. 5 Stars for Splintered Forest! The service was great - they showed up when they said they would, they did an amazing job taking down our marked trees, they cleaned up everything incredibly well. I HIGHLY recommend this company! I have used splintered forest for both personal work and Home Owner Association work. Having been president of our HOA I hired them to do extensive fire mitigation work that was well received by the homeowners. They do a professional job and will help resolve issues that your insurance company may be asking you to address. I recommend Brad Huddleston, Alex Gulledge, and the team of employees at this company. We hired this team after our insurance was cancelled because we had never performed fire mitigation on our cabin in Como. We had no idea this was even a requirement, although it makes sense. It would have been nice for the insurance company to inform us before the fact so we COULD mitigate, but that is another story. Splintered Forest came and gave us the initial evaluation proving that we had a lot of work to do, they were detailed in what needed to be accomplished. Through several months of very hard work, they were able to finally inform our insurance company that we were up to code. Brad and Kara were quick to reply to our emails and were very professional in their responses. I am glad that we partnered with this company to get our cabin safe and insured again. Alex and Darren showed up right on time and got to work quick. I had some big trees close to some power lines and the house that had to come down. They were fast efficient and had no problems. Extremely friendly, very professional and awesome work. Thanks! This is an awesome forest mitigation company - great ownership and great employees. We are privileged to partner with them in the CDL training and testing of their workers. Brad and the rest of the gang - all the best to you! My husband and I just moved to CO. And purchased our dream home. Our insurance mandated we mitigate the property. We already decided on calling Splintered Forest after meeting the Team at the Conifer Home Show, so there was NO hesitation as to who to call. The Team came to us over this July 23rd and 24th. They went out of their way to schedule on behalf of our insurance...simply amazing! Brad and Kara thought of our needs, we were treated with the utmost respect, and the mitigation Team was the best...personally and professionally. Everyone has an amazing love and respect for nature, their team, and their job! A privilege, a pleasure!!! The Splintered Forest team recently finished my defensible space plan. I am so impressed with the attention to aesthetics and how they turned my over-grown property to a beautiful mountain park. I still have an abundance of trees, but the dead limbs, dead and dying underbrush and the spreading junipers are all removed. I actually have sunshine on my yard and the bonus is the 4 cords of wood now stacked and seasoning for next year. Fast, efficient and well done- you are "forest artists"! Look no further....Splintered Forest sets the standard! The team is courteous, conscientious and thorough. I most enthusiastically recommend them!! Professional, timely, safe, friendly and affordable. 5 stars for Splintered Forest. A great team of professionals! They made my property look very nice. Once overgrown and prone to disaster, now compliant with my insurance company. I highly recommend Splintered Forest for your fire mitigation needs! Great group who have done an excellent job with my clients. Brad has removed trees for us on our lot in the Highlands for two years. Not only does he do a great job at tree removal, he is dependable, and efficient! He delivers what he promises at a great price! We highly recommend Splintered Forest for tree removal! A huge thank you to you, Scott, Alex and Brandon for doing such a great job trimming and taking down two of our trees. Everything was done to perfection. We so appreciate your professionalism, friendliness, helpfulness and respect for us and our trees. It was such a pleasure doing business with you. Brad and his team did a very complete and conscientious job of fire mitigation for our Troutdale Village Community. They were sensitive to the homeowner needs while performing their task of giving us a safer neighborhood. These guys actually care about what they do. I was asked multiple time if everything went ok. Because of the level of customer service, I won't do business anywhere else.